A group of fundamentalist Jewish settlers, including members of the Kach terrorist movement outlawed by Israel itself, attacked the funeral of Rabbi Moshe Hirsch, head of the Neturei Karta Jewish group that denounces Zionism and refuses to recognize the existence of Israel. The fundamentalist settlers attacked the funeral procession chanting slogans against Rabbi Hirsch and describing him as an enemy to Israel, the Maan News Agency reported. The settlers described the death of Rabbi Hirsch as a happy event, and happy day for Israel, and wished that he “goes to hell”. Hirsch worked as a Jewish Affairs advisor to the late Palestinian President, Yasser Arafat, and had special relations with the Palestinian people as he supported their struggle for freedom and independence. Members of the group do not recognize Israel’s flag or independence, and burnt Israeli flags in several occasions. 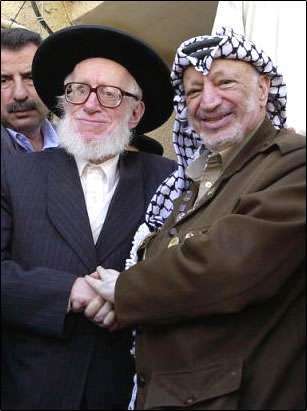 Hirsch used to describe Arafat as a brother and as a friend, and believed that “Israel is a lie that must be removed”. The group believes that the state of Israel can only be established when the Messiah returns, and that any attempt to “regain the land of Israel by force is against the divine will”. It is worth mentioning that Hirsch was once attacked by fundamentalist settlers who doused him with acid and lost one eye in the attack. Neturei-Karta is the Aramaic term for ‘Guardians of the City”. The name Neturei-Karta originates from an incident in which R. Yehudah Ha-Nassi (Rabbi Judah the Prince) sent R. Hiyya and R. Ashi on a pastoral tour of inspection. In one town they asked to see the ‘guardians of the city’ and the city guard was paraded before them. They said that these were not the guardians of the city but its destroyers, which prompted the citizens to ask who, then, could be considered the guardians. The rabbis answered, ‘The scribes and the scholars,’ referring them to Tehillim (Psalms) Chap. 127. (Jerusalem Talmud, Tractate Hagiga. 76c). The name was given to a group of Orthodox Jews in Jerusalem who refused (and still refuse) to recognize the existence or authority of the so-called ‘State of Israel’ and made (and still make) a point of publicly demonstrating their position, the position of the Torah and authentic unadulterated Judaism. The group was founded in Jerusalem, Palestine in 1938, splitting off from Agudas Yisroel. Agudas Yisroel was established in 1912 for the purpose of fighting Zionism. Gradually lured by money and honor they sold out to the ‘Golden-Calf’ (see Exodus, XXXII) of Zionism. Those who wanted to maintain their faith and continue the struggle against Zionism, dissociated themselves from Agudas Yisroel and associated parties.